Join me in this wholehearted group for women striving to dare greatly. Rising Strong™ is based on the simple physics of vulnerability: If we are brave enough, often enough, we will fall. This is a curriculum about what it takes to get back up and how owning our stories of struggle gives us the power to write a daring new ending. Struggle can be our greatest call to courage and the clearest path to a wholehearted life. For those of you not familiar with Dr. Brown’s work, The Daring Way™ is a highly experiential training that was developed out of her twelve-plus years of research on vulnerability, courage, shame and worthiness. The method was developed to help men, women, and adolescents learn how to show up, be seen, and live braver lives. It offers participants the chance to examine the thoughts, emotions, and behaviors that hold us back and then the new choices and practices that will move us forward and transform how we live, love, parent, lead and work. 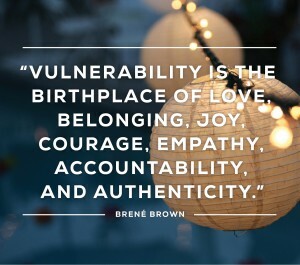 Brené’s 2010 TEDx Houston talk, “The Power of Vulnerability” is one of the top ten most viewed TED talks in the world, with over 14 million viewers. 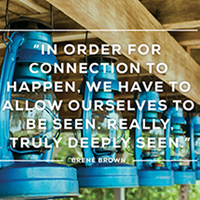 Further information is available at www.brenebrown.com and www.thedaringway.com.